A beautiful 16-month (Sept 2018 to Dec 2019) art calendar from composed, designed and printed in the Galilee of Israel. 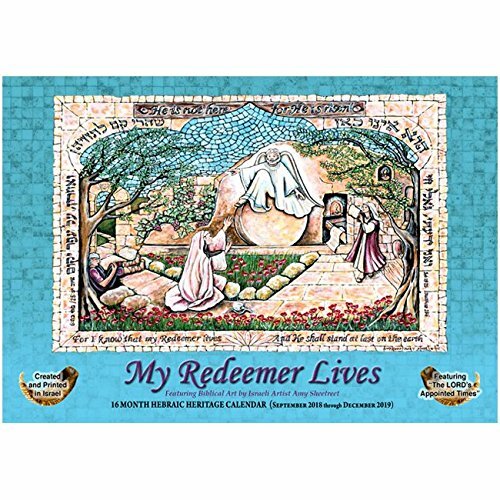 It features sixteen beautiful graphic illustrations of Isaiah chapter 60 by Israeli artist Karin Foreman each month displaying a verse from Psalm 23. This stunning calendar is the perfect accompaniment to your devotions for the year. It is the most comprehensive Messianic Hebraic calendar you will find. ALL MAJOR BIBLICAL/JEWISH HOLIDAYS ("The LORD's Appointed Times") explained in a special reference chart at back of calendar. MAJOR ISRAELI HOLIDAYS also included. If you have any questions about this product by Biblical-World, contact us by completing and submitting the form below. If you are looking for a specif part number, please include it with your message.